Smokey and Impressive Volvo Truck Drift Around A Roundabout! If you think owning a Volvo truck is nothing special, you should think again. 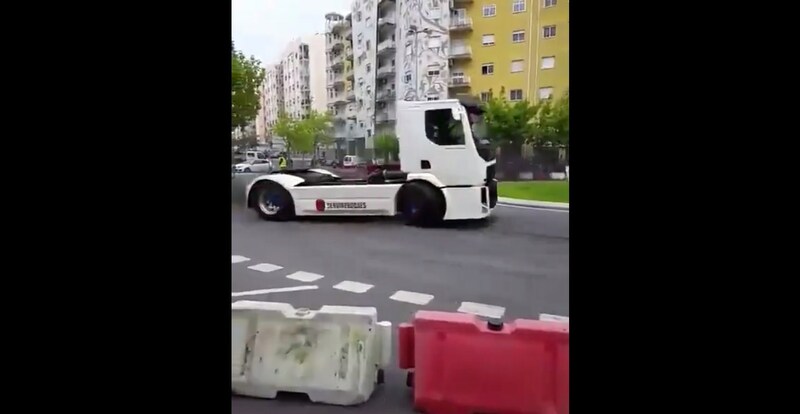 This driver showed everyone just how cool it is to drift with your very own Volvo truck. On top of that, he does it on the city streets. `Impressive` truly is the right word to describe this. Drifting is an art of its own, but drifting with a truck requires a special skill set which this guy possesses. He controls this beast impeccably. He drifts three whole times around the roundabout. In other words, he performs the Volvo truck drift with this bad boy any way he feels like. This truck driver never misses a thing. You might think that his actions are weird, maybe even crazy, but you have to admit that a Volvo truck drift in the middle of the day at the city streets takes some courage. However, judging by the barriers on the side, it seems like this is some kind of a competition. Anyways, not everyone would try this out. But if you are an adrenaline addict, you completely understand this guy. You applaud him and you are inspired by him. It makes you want to try it out yourself. This guy proves that you can drift with a Volvo truck, and that you can drift magnificently. Finally, click here to watch one insane battle between a Toyota Hilux and a Volvo truck! Place your bets!